On January 12, 1782, Cheraw Hill Baptist Church had its constitution granted by the Welch Neck Baptist Church, in Society Hill, SC. The church consisted of both black and white members. By the 1860s, the black members who had become the majority, applied for and received letters of dismissal from the church. Twenty-three letters were granted immediately. Pee Dee Union Baptist Church was founded just a few yards from the original Cheraw Hill Baptist Church. In January 1867 Rev. Wisdom London, the church’s founder, preached the first message from a platform built outdoors. 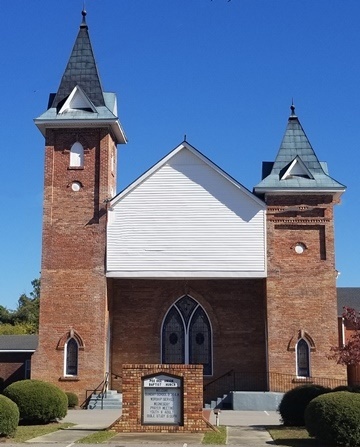 In December of that same year, 285 blacks applied for and received letters to join Pee Dee Union Baptist Church, and the first wooden building was constructed. That building was destroyed by a tornado in March 1912. Later that year, the present structure was rebuilt on the same parcel of land. A historical marker was erected on the site by the congregation in 2003.